While a barber definitely needs scissors to do his job, it’ll take him forever to get through each customer. But with clippers, shaving becomes that much faster and efficient. Same goes for hedge trimmers here; with a decent trimmer, you’ll be able to groom and sculpt your hedges, shrubs, and bushes in no time and still have enough left to enjoy your well-manicured yard. Now, for those of you readers who have ever had the unfortunate luck of pruning hedges with manual shears, you know exactly how painfully slow and excruciating in can be. A good trimmer can be a Godsend when it comes to achieving a cleaner, sharper finish and saving some elbow grease. So while most of you here might not be looking to go all Edward Scissorhands and clip your hedges into animal shapes, a properly matched trimmer will certainly make your daily trimming chores much easier. I know you’re a busy bee, so I’ll get right to it. I’ve done the hard yards for all the hands-on people of UK and compiled a quick list of the best hedge trimmers in the kingdom. Why don’t you have a look and see which one fits your style better? Perfectly balanced, finely honed and with an incredibly powerful 600W motor, the Bosch AHS 60-26 Electric Hedge Cutter is ideal for medium to large hedges and a great entry into the world of trimmers. The trimmer comes with a Laser-cut, diamond-ground blade for optimum quality and 26mm tooth spacing for clean, accurate cuts. The machine also boasts of a sawing function at the blade tip that allows you to saw through up to 32mm of branches. Like most of the other trimmers from Bosch, the AHS 60-26 comes with the preferred ergonomic design that makes it super easy to use and comfortable to hold. And since it weighs in at only 3.6Kg, your arms and back won’t have to bear much weight. Bosch takes your safety very seriously, that’s why they incorporate a see-through hand guard that keeps your fingers safe without blocking out your view. The icing on the cake comes in the form of a free 2-year guarantee that can be extended to 3 if you register your trimmer with Bosch. Introducing the smallest, cheapest and least powerful hedge trimmer in the Bosch lineup, the AHS 60-16 Electric Hedge Cutter is designed for small hedges and backyard fences. This compact and lightweight trimmer manages a decent 450W on the motor which drives a 60cm diamond-ground blade. The only difference with the above model is that this one has 16mm tooth openings which although the do allow for a very precise cut, they may not really make it through medium or large hedges. Like it’s much larger siblings, the AHS60-16 is also designed to be as balanced and as ergonomic as possible. This allows for a well-balanced and effortless trimming experience. Couple that with the fact that it only weighs 2.7Kg and you can say goodbye to any hand, back or leg strain. The 10-meter cable ensures that you don’t face any problems with reach or have to deal with pesky extensions. As for the safety features, the unit incorporates two safe switches to ensure that there are no accidental power-ons. The GT6060 600W 60cm Hedge Trimmer is one of Black & Decker’s most versatile, practical and durable two handed hedge trimmer on the market. 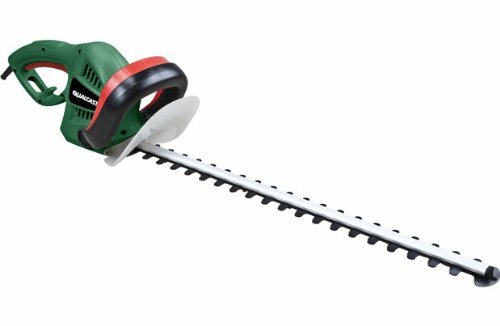 This 600W powerhouse has all the power you need to get through any hedge thickness thanks to the 60cm, asymmetric, dual action blades. It’s generously sized blade makes this model feel right at home with medium and large bushes. The angle of the blade also lets you achieve better cut performance. Aside from the extra length blade that trims quickly and efficiently, the GT6060 is also designed to provide even weight distribution between blade and handle. This allows for improved balance on the vertical cut line as well as horizontally. Black & Decker really brought it home by squeezing all these features in a compact, 3Kg package; no more having to strain your back carrying a load all day. For your safety, the manufacturer included a smart, two-handed safe-start switch to prevent accidental starts and a protective guard for debris. For those of you who haven’t seen the new Qualcast Electric Hedge Trimmer, picture using a swordfish to trim your hedges. This nifty trimmer resembles a swordfish both in shape and performance too. Boasting of an entire host of features and trimming positions, this unit will definitely be a brilliant addition to the average garden. The Electric Hedge Trimmer from Qualcast incorporates a powerful 600W motor and a blade length of 60cm to achieve robust and accurate cuts. The 20mm tooth gap just indicates the max diameter you can attempt to cut with the blade. Similarly, the blades are precision and diamond ground to achieve fast-paced yet low vibrating cutting action – a crucial feature if you’re looking to go all Michael Angelo on your bushes. The manufacturer featured a blade tip protector to keep your sharp edge away from walls and rocks. But that’s not the only safety feature. The Qualcast Electric Trimmer also includes a dual safety switch and electronic brakes to ensure that no accidents happen while you’re on the job. All this talk about the different types of trimmers can be very confusing. Why don’t I clear that right up with a comprehensive overview of the types of hedge trimmers? Once you know your models better, you will be able to make an informed decision on what’s best for your pockets and hedges too. Due to their versatility, affordability and lightweight nature, electric trimmers are by far the most popular type of them all. In addition to being ultra-light, electric models are highly powerful machines with an electrical cord that typically extends to the far end of a small garden. Since you’ll have to plug the hedge trimmer into the mains, electric models are more suited for people with hedges that are closer to the house. However, handy homeowners all over the UK don’t mind installing outdoor outlets and using cable extension. But on the upside, electric hedge trimmers are compact and cheaper than cordless and petrol trimmers. If what you’re looking for is the freedom and flexibility to trim and cut hedges that are too far from the power mains, then the cordless hedge trimmer is your new best friend. The typical cordless models come with 36V batteries that can be recharged when not in use. Some cordless trimmers have been known to provide up to 60 minutes of use per charge against these tough UK hedges. However, higher-end models allow for up to 2 hours of continuous use without needing a recharge. Aside from the fact that they’re quite expensive, my research reveals that hedge trimmer owners find the batteries quite unreliable for larger jobs. Which is why most professional hedge trimmers pack a second or even third battery pack for more freedom. Otherwise known as the lumberjack’s best friend, petrol trimmers are the ideal solution to larger tougher and thicker hedges that are miles away from any reliable power source. Unlike both electric and cordless models, you don’t have to worry about any extension cords or battery running out. All you need is literally just a can of petrol with some two-stroke oil mixed in and you could be lost in the wilderness for days on end. In addition to being able to take it anywhere, petrol powered trimmers cut faster and better than other models. However, this type also carries more downsides than any other model. Not only are petrol powered hedge trimmers much heavier than other models, but they also make quite the ruckus with loud vibrations to boot. And the engine tends to stall once in a while too. If you have thick, tall hedges, the easiest and safest way to cut them us from the ground. This is where long-reach hedge trimmers with long adjustable blades come to the rescue. This type lets you easily extend the blade and tilt it to cut either the side or the top of the hedge. While extendable trimmers are a category on their own, they are still available as electric, cordless or petrol models. Other even come with optional strimmer heads, pruners and long reach conversion tools that effectively turn the ordinary trimmer into a super powered multi-purpose unit. So not only do you get a variety of different tools for different jobs, but you also get all these without having to buy any additional motors. It’s common sense that a trimmer with a longer blade cuts a hedge quicker than one with a shorter blade. However, the extra length also means more weight on your trimmer as well as less manoeuvrability on the job. If you want more length, you’ll have to be prepared to pay the price in form of hand and back strain (and in the form of money too). If you’re a professional gardener or landscaper who has to work hard and fast, then you’ll need to sacrifice your comfort and get as long a blade on your trimmer as you can. However, longer blades will be more cumbersome for the occasional backyard warrior who just needs something shorter for smaller hedges. It’s all up to you to decide what length blade you want; from 70cm all the way to a petite 45cm, there’s something for everyone. Typically, hedge trimmers will cut down any branch that will fit in between its teeth (in theory at least). Basically, most hedge trimmers have teeth that are anywhere between 16mm and 22mm apart. However, some of these UK branches and hedges are way thicker than that. If you’re looking to cut larger branches with thicker diameter, make sure you have enough power behind that bad boy such as a 600W electric motor or petrol engine. It might also help to note that for those larger, drier and thicker branches, nothing beats the old fashioned secateurs or some loppers for a neater, cleaner cut. While I already had a gander at how blade length affects weight, that’s just a small part of it. Since you’ll be constantly carrying, moving and swinging your hedge trimmer, you can expect massive strain on your shoulders, arms, and back. If you’re not a professional gardener and find it quite tiring to trim your lengthy hedges, then you’ll have to settle for a much lighter model. However, professional landscapers who spend all day cutting a lot of hedges might want to go for something heavier. This will help them cut through shrubs more quickly and avoid the fatigue that comes with forcing a light model through dense hedges. If you’re going to buy an electric trimmer, then the length of the cable and power capacity of the batteries are two of the most crucial aspects you have to consider. You’ll want to buy a machine that is practical and efficient according to its intended use. For corded electric models, the cable length should allow you to at least get to the farthest point in your compound. However, you might be able to compensate for shorter cables with extensions. If you’re going with a cordless model, then you’ll want to make sure that the battery has enough power to at least make it through your entire hedge with one single charge without running empty. This will help you avoid leaving an untidy, half-trimmed hedge all over the place. However, you don’t want to go overkill with the power capacity. Since cordless models come with batteries that vary from 12V all the way to an impressive 56V, it’s better to pick a range that is just perfect for the job. Get it wrong, and you could end up with a stupid expensive trimmer that slices through everything like butter or a cheap unit that can barely make a dent on a twig. I’ve done my part and informed you on everything you need to know about the best hedge trimmers in the UK; the ball is now in your court. Be sure to get your match today and let me know how it goes.